Wang, C. S., Whitson, J. A., Anicich, E. R., Kray, L. J., & Galinsky, A. D. (2017). Challenge your stigma: How to re-frame and re-value negative stereotypes and slurs. Current Directions in Psychological Science, 26, 75–80. A stigma — originally a branding-iron mark on a prisoner or slave — serves as a mark of disgrace. To carry the stigma of a bankruptcy, an HIV infection, an addiction, a reviled religion, or another negatively stereotyped social group is to be dishonored, disapproved, or even dehumanized by others. 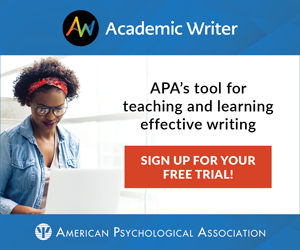 For those scarred by a stigma, note Cynthia S. Wang, Jennifer A. Whitson, Eric R. Anicich, Laura J. Kray, and APS Fellow Adam D. Galinsky (2017), the psychological effects may be either overt or covert. A possible overt result is discrimination: Those stigmatized are often avoided, not hired, unloved. A possible covert result is internalization of the stereotypes and slurs: Women may lose their motivation to lead others; the elderly may presume they are too slow for the demands of work; gay youth may harbor suicidal thoughts. Write a paragraph or two that describes how they or someone they know has experienced stigma and how they dealt with it. The reason for the stigma can vary; people’s experiences may be related to their race, their weight, their disability, their age, their gender, their religion, their family status, or even their college major (think of “jocks” and “nerds”). Then, using the “snowball technique,” have students crumple their sheet into a “snowball” and, all at once, throw their snowballs into the air around the room. Finally, ask students: Are there any commonalities across the examples — perhaps of people being hurt by bullying or discrimination, or of people internalizing self-loathing? To protect themselves from toxic stigma, people may seek to escape from the stigmatized group. Or they may challenge the stigma, either by reframing the stigma as a strength or by embracing the stigma with self-labeling. Escape. Much like the Apostle Peter’s denial that he was one of Jesus’s maligned disciples, people may dis-identify with the stigmatized group. They may disavow their group identity or stay in the so-called closet. Reframe. Instead of evading a stigma, people may confront it and reframe a negative stereotype as a strength. Stereotypically feminine traits such as empathy, which sometimes are perceived as weaknesses for women in the workplace, can be transformed into gifts. In negotiations, for example, building trust through empathic understanding of the other’s concerns can facilitate a better deal; thus, a liability can become a valued asset. Self-labeling. “By self-labeling,” observe Wang et al., “stigmatized group members transform a slur’s connotative meaning from demeaning to empowering.” Once used to degrade gay people, the word “queer” now is used as a term of self-empowerment. Yesterday’s “deaf and dumb” becomes today’s proud Deaf culture. Donald Trump’s Hillary-Clinton-disparaging “nasty woman” comment prompts the proud “nasty women” artists, marchers, and T-shirt wearers. Are any of these coping strategies evident in the snowballed case examples? Ask the class to reflect on whether they heard examples of people coping by escaping, reframing, or self-labeling when the snowballs were read aloud. And invite them to remember how social stigmas often beget both discrimination and internalization. Nairne, J., VanArsdall, J., & Cogdill, M. (2017). Remembering the living: Episodic memory is tuned to animacy. Current Directions in Psychological Science, 26, 22–27. What makes things memorable? This question has intrigued people from all walks of life, and for good reason, as there are tremendous advantages to improving the memorability of information. We could learn more effectively; we could reduce costly and embarrassing mistakes that result from forgetfulness; we could improve our relationships by remembering important dates (e.g., anniversaries, birthdays) and names (e.g., friends, coworkers, classmates). Knowing what makes something memorable also may help us understand how our memories work and the types of problems that memory is designed to help us solve. Rats, for example, have strong memory for spatial locations, which helps them find food and avoid predators. We have some sense of the factors that make items stick in our memory. For example, we more easily remember words that are concrete (e.g., table) versus abstract (e.g., justice), in part because it’s easier to create a mental picture of a table than of justice. Bizarre, rather than mundane, items also get lodged in memory. It’s easy to remember a dog riding a bicycle. It’s easy to forget that same dog chasing a bicycle. Emotionality, familiarity, frequency, and meaningfulness also matter. Nairne and colleagues (2017) suggest an additional factor that offers a potentially even more potent memory benefit: animacy. They posit that the distinction between the living and the nonliving is highly salient to the human mind: We may be hardwired to detect and remember animate information. You can demonstrate the influence of animacy on memory in the classroom by having students complete two simple exercises, which together should take about 8 minutes. Memory for animate versus inanimate objects (from Nairne, VanArsdall, Pandeirada, Cogdill, & LeBreton, 2013). You can read them aloud or present them one at a time for 5 seconds each using a visual display. After a short delay, have students try to recall the words. Animacy processing (from VanArsdall, Nairne, Pandeirada, & Blunt, 2013). After you complete this task, ask students to write down all the nonsense syllables they can remember. When students have completed both tasks, have them review their answers. In the first task, did they remember more animate than inanimate items? Nairne et al. (2013) found a strong advantage for the animate items, despite the fact that the animate and inanimate items were intentionally matched on 10 mnemonically relevant dimensions such as imagery, emotionality, and familiarity. This finding has been replicated in other labs even when the words are drawn from small categories (e.g., four-footed animals and furniture; VanArsdall, Nairne, Pandeirada, & Cogdill, 2016), or when pictures are used instead of words (Bonin, Gelin, & Bugaiska, 2014). In the second task, did students recall more nonsense syllabus that had animate properties than those that had inanimate properties? VanArsdall et al. (2013) found that meaningless nonsense syllables associated with animate properties were more memorable than those associated with inanimate properties. Animacy — as both an inherent property of an item and as a way of thinking about an item — seems to convey a significant memory advantage. Does this mean that our cognitive systems are tuned to detect and remember animate things? Nairne and colleagues think so. Ask students what other evidence might convince them that animacy is central to cognition. Early in the first year of life, human infants understand that animate, but not inanimate, objects are capable of self-propelled movement (Markson & Spelke, 2006). Preschool children as young as 3 or 4 years of age can easily distinguish between living and nonliving things (Heyman & Gelman, 2000). People are faster and more accurate in detecting changes to a visual scene when the changes involve an animate object than when they do not (New, Cosmides, & Tooby, 2007). We remember objects touched by a person or animal (e.g., a ball touched by a pitcher) better than objects touched by other inanimate objects (e.g., a ball touched by a mitt; Cogdill, Nairne, & Pandeirada, 2016). If students are compelled by these findings, it might be worthwhile to consider two issues. First, how might they apply these findings to enhance memory in their everyday lives? As one example, note that it may be easier to learn a foreign language by starting with terms for animate objects. VanArsdall, Nairne, Pandeirada, and Cogdill (2015) showed that participants learned foreign language terms that matched animate English terms faster than those paired with inanimate English terms. The second issue to consider is a methodological one: Ask students to define animacy. At first blush, the distinction between living and nonliving things seems straightforward, but there are a number of items that fall in a gray area. For example, how would students classify blood? What about objects like robots that have animate qualities (think Siri or Alexa)? An essential task of science is to make a priori predictions about human behavior. To do that, we have to carefully understand and define concepts like animacy. Bonin, P., Gelin, M., & Bugaiska, A. (2014). Animates are better remembered than inanimates: Further evidence from word and picture stimuli. Memory & Cognition, 42, 370–382. Cogdill, M., Nairne, J. S., & Pandeirada, J. N. S. (2016, May). Enhanced retention for objects touched by agents. Poster presented at the 28th Annual Convention of the Association for Psychological Science, Chicago, IL. Heyman, G. D., & Gelman, S. A. (2000). Preschool children’s use of trait labels to make inductive inferences. Journal of Experimental Child Psychology, 77, 1–19. Markson, L., & Spelke, E. S. (2006). Infants’ rapid learning about self-propelled objects. Infancy, 9, 45–71. Nairne, J. S., VanArsdall, J. E., Pandeirada, J. N., Cogdill, M., & LeBreton, J. M. (2013). Adaptive memory: The mnemonic value of animacy. Psychological Science, 24, 2099–2105. New, J., Cosmides, L., & Tooby, J. (2007). Category-specific attention for animals reflects ancestral priorities, not expertise. Proceedings of the National Academy of Sciences of the United States of America, 104, 16598–16603. VanArsdall, J. E., Nairne, J. S., Pandeirada, J. N., & Blunt, J. R. (2013). Adaptive memory: Animacy processing produces mnemonic advantages. Experimental Psychology, 60, 172–178. VanArsdall, J. E., Nairne, J. S., Pandeirada, J. N., & Cogdill, M. (2015). Adaptive memory: Animacy effects persist in paired-associate learning. Memory, 23, 657–663. VanArsdall, J. E., Nairne, J. S., Pandeirada, J. N., & Cogdill, M. (2016). A categorical recall strategy does not explain animacy effects in episodic memory. Quarterly Journal of Experimental Psychology. Advance online publication. doi:10.1080/17470218.2016.1159707.